A series of recent racist incidents highlight just how many U.S. citizens still view Spanish through a lens of suspicion and disdain. In 2001, in the midst of a recession, my father lost his job. I watched with frustration as he struggled to apply to positions he was far overqualified for; selfishly, I did not want to be known around school as the girl with the unemployed dad. We lived in a predominantly upper-class, white neighborhood in Florida where I was usually one of the only Latinx students in my high school classes. I worried my father’s situation would only confirm stereotypes I knew others had about us. I feared it would add to the feeling — perceived if never really articulated — that my family had not really assimilated. One night over dinner, my father made an English grammar mistake and I snapped: "How have you let your English get so bad, Papi. No wonder you can't get a job." My mother immediately came to his defense, scolding me for being so disrespectful. Where was this spite coming from? At some point during my 15 years living in the United States, I had learned to become ashamed of my own father. I had bought into the idea that his deeply accented and imperfect English made our family less worthy than others. At some point during my 15 years living in the United States, I had learned to become ashamed of my own father. Reading the news these past few weeks, I am realizing just how deeply the roots of that shame extend down into our culture. A few weeks ago, a white woman eating at a Mexican restaurant in West Virginia insulted the manager after she heard him speak Spanish, saying “English is our first language, so you need to speak English. Get the f--- out of my country.” In February, the management of an apartment building in Houston sent a resident a letter asking her to speak “English Only” in the building’s lobby. Vox recently reported that two women in Montana have sued U.S. Border Patrol after being detained simply for speaking Spanish at a gas station. Incidents like these have been surfacing all year. According to a survey by Pew Research, nearly four in 10 Latinos say they experienced some kind of harassment related to their ethnicity in 2018. The Guardian reported last year on a woman kicked out of a Florida UPS for speaking Spanish, and last May a video of attorney New York Aaron Schlossberg threatening to call Immigration and Customs Enforcement (ICE) on two employees speaking Spanish to each other at a restaurant went viral. All this paranoia, to be clear, is completely unnecessary: Research from the Public Policy Institute of California shows that around 96 percent of second-generation immigrant children speak English well. By the third generation, the PPIC says 96 percent of people from all immigrant backgrounds report not speaking any other language other than English at home. Though I have thankfully never experienced anything as extreme as the racist incidents above, that dinner with my father back in high school made clear that I had still deeply internalized the message motivating them: Perfect English was the ideal, and speaking Spanish was neither necessary nor, really, desirable. Just a few days ago, Rep. Alexandria Ocasio-Cortez, a sitting congresswoman, was mocked by conservative commentators for the way she pronounces her own name. These cases all illustrate the deep resentment and even paranoia that has surfaced around Spanish/English bilingualism. Clearly, too many U.S. citizens view Spanish mostly through a lens of suspicion and disdain. Clearly, too many U.S. citizens view Spanish mostly through a lens of suspicion and disdain. This prejudiced perspective also misses the huge opportunity of bilingualism. More people speak Spanish in the United States than even in Spain, but as a Latinx friend put it recently, “In the United States we may speak Spanish, but we are not a Spanish-speaking country.” There is no pride in Spanish/English bilingualism, even though several studies have proven the many cognitive benefits of speaking two languages: increased focus, better problem-solving skills, delaying the onset of dementia and even a link to higher levels of empathy. Carmen Fought, a linguistics professor at Pitzer College, recently told the Los Angeles Times that "prejudice against Spanish is not about Spanish the language; it’s about the people who speak Spanish.” When I think about that incident with my father now, I realize so much of it had to do with my own self-hate. My outburst was not about my father’s brief unemployment or his minor mistakes, but about my own anxious obsession with proving that our family was good enough to live in the United States. 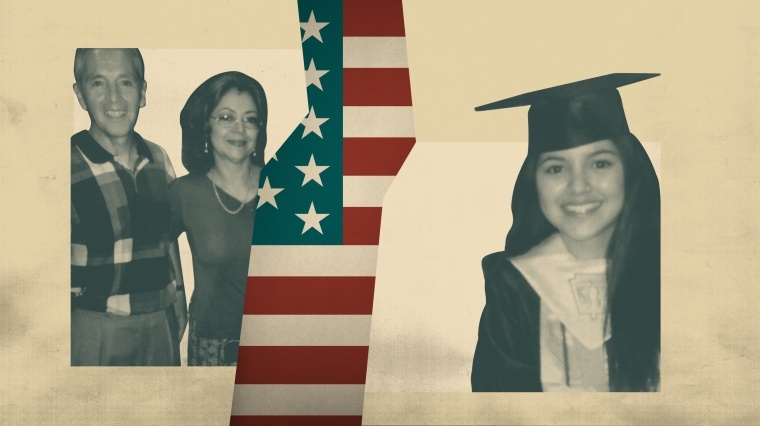 These days, I am no longer interested in that definition of immigrant success. As I try to unlearn my own internalized xenophobia, I am not interested in anyone who does not want to see the magic immigrants like my father create in two languages. During the holidays, when my brother and I sat down together to research our retirement plans, we both got lost in the language of finance we both couldn’t speak. In that moment, we recalled an image we both had as kids of our father: him, hunched over the business section of the newspaper, learning everything he could. Somehow, my father taught himself the stock market in English and navigated his finances in a way my brother and I to this day cannot understand on our own. As adults, we now stand in awe of what my father has accomplished. My father came to this country with dreams and achieved every single one of them — heavy accent and errors and all. I am learning to see this family legacy now as a mesmerizing gift.